Purchase the fully updated iOS 12 / Xcode 10 edition of this book in eBook format for only $24.99. If you have spent an appreciable amount of time using an iPhone the chances are good that you have interacted with a UIKit Table View object. 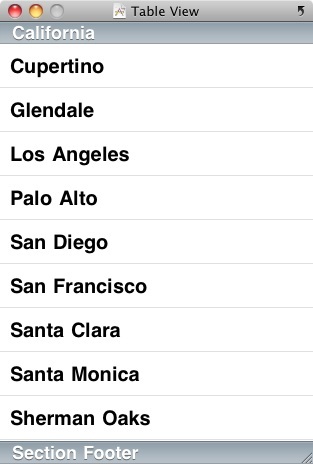 Table Views are the cornerstone of the navigation system for many iOS iPhone applications. For example, both the iPhone Mail and Settings applications make extensive use of Table Views to present information to users in a list format and to enable users to drill down to more detailed information by selecting a particular list item. Whilst most implementations of table views involve the use of navigation, this chapter is intended to focus entirely on just the table view, including the creation of a very simple example. This will provide a good understanding of table views in general before moving on to a more complex navigation based example in Creating a Navigation based iOS 4 iPhone Application using TableViews. 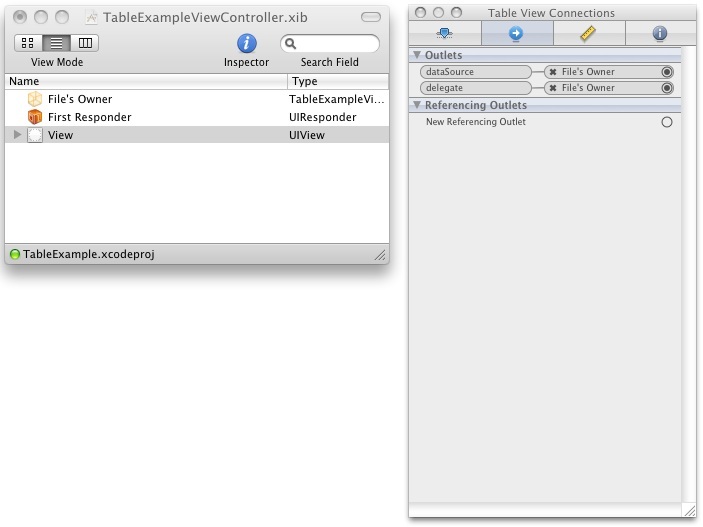 Table Views present the user with data in a list format and are represented by the UITableView class of the UIKit framework. The data is presented in rows, whereby the content of each row is implemented in the form of a UITableViewCell object. Each table cell can display a text label (textLabel), a subtitle (detailedTextLabel) and an image (imageView). More complex cells can be created by either adding subviews to the cell, or sub classing UITableViewCell and adding your own custom functionality. Each table view in an application needs to have a delegate and a dataSource associated with it. The dataSource implements the UITableViewDataSource protocol, which basically consists of a number of methods that define title information, how many rows of data are to be displayed, how the data is divided into different sections and, most importantly, supplies the table view with the cell objects to be displayed. The delegate implements the UITableViewDelegate protocol and provides additional control over the appearance and functionality of the table view including detecting when a user touches a specific row, defining custom row heights and indentations and also implementation of row deletion and editing functions. Table Views using plain style can also be indexed, whereby rows are organized into groups according to specified criteria, such as alphabetical or numerical sorting. 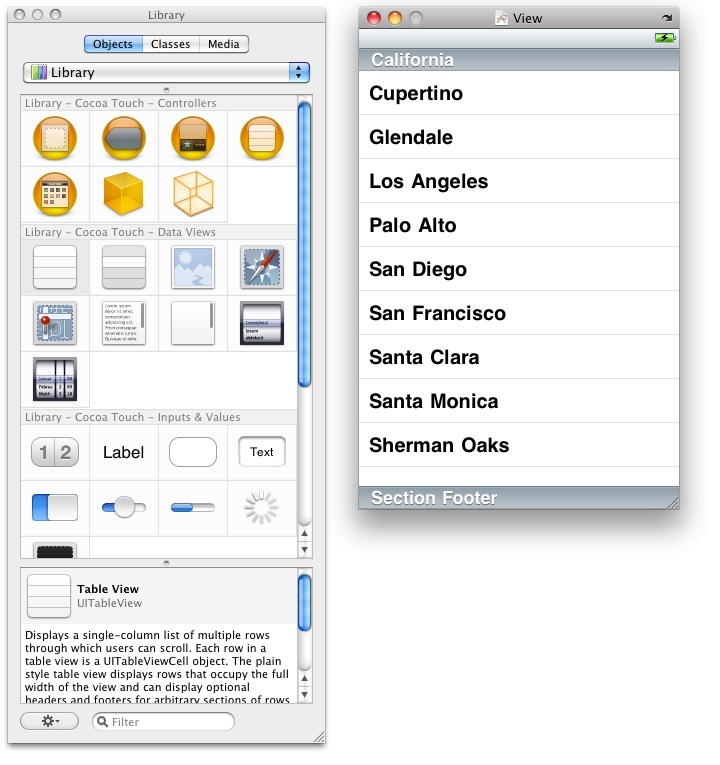 UITableViewCellStyleDefault – only the labelText in black and left aligned. UITableViewCellStyleSubtitle – labelText in black and left aligned with the detailLabeltext positioned beneath it in a smaller font using a gray foreground. UITableViewCellStyleValue1 – labelText in black left aligned and the smaller detailLabelText in blue, on the same line and right aligned. 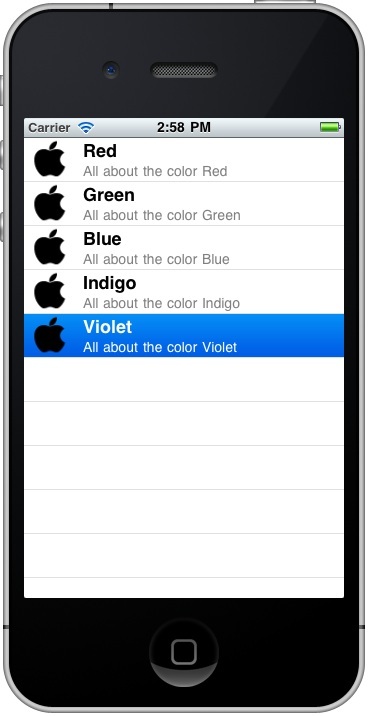 UITableViewCellStyleValue2 – labelText in blue on left side of cell, right aligned and detailedLabelText on right of cell, left aligned and black. The style of a particular cell is specified when the cell object is created and will be covered in detail in a later section. For the purposes of this chapter we will be creating a very simple iOS 4 iPhone application that contains a single Table View. Begin by launching Xcode and selecting the option to Create a new Xcode Project. In the New Project window, select View-based application, make sure that the Product selection is set to iPhone, click Choose… and name the project TableExample. 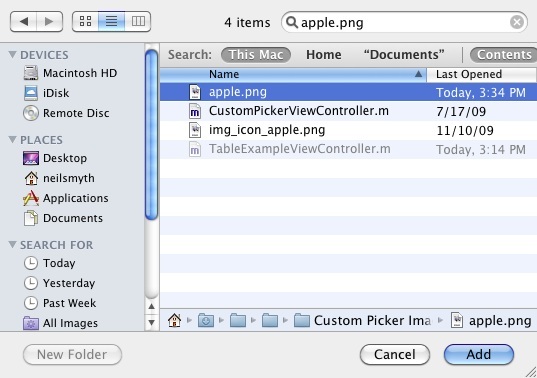 Now that the connections have been established, save the file and exit from Interface Builder. Note the references to UITableViewDelegate and UITableViewDataSource in the above code. These are included to notify the Objective-C compiler that the class implements these two protocols. Consequently, if we fail to implement the mandatory methods required by these protocols the compiler will notify us with a warning. If this line is omitted from the class declaration the code will still compile, but we will not be warned if we have failed to implement any methods. The only indication we will get will the application crashing at run time. For this reason, including these declarations is generally considered to be good programming practice. // Implement viewDidLoad to do additional setup after loading the view, typically from a nib. // Release any retained subviews of the main view. // Customize the number of rows in the table view. // Customize the appearance of table view cells. The method begins by creating a cell identifier. Next, an attempt is made to reuse an existing cell that may have scrolled off the screen and is therefore available for use as the currently requested cell. 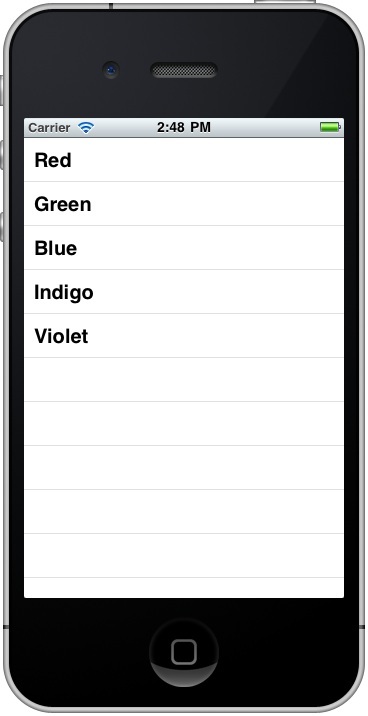 If no previous cell is available for use then a new one is created using the UITableViewCellStyleDefault style. The cellForRowAtIndexPath method is passed as an argument an object of type NSIndexPath from which we are able to extract the row number for which the cell is being requested by the table view. This row number is used, in turn, to extract the corresponding element from our colorNames array and assign it to the textLabel property of the cell object. Once the appropriate image file has been selected, click on the Add button to add the image to the resources. On the following panel accept the default settings and click Add once again. This page was last modified on 27 October 2016, at 19:55.